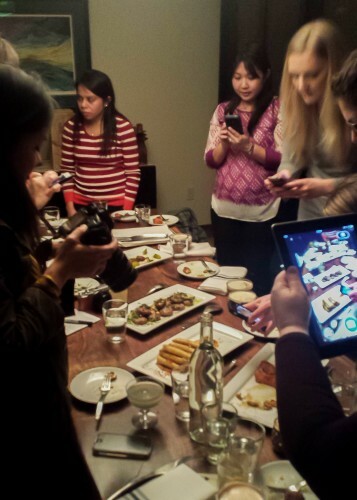 Food+Bloggers+Karaoke Buss= One Epic Event! 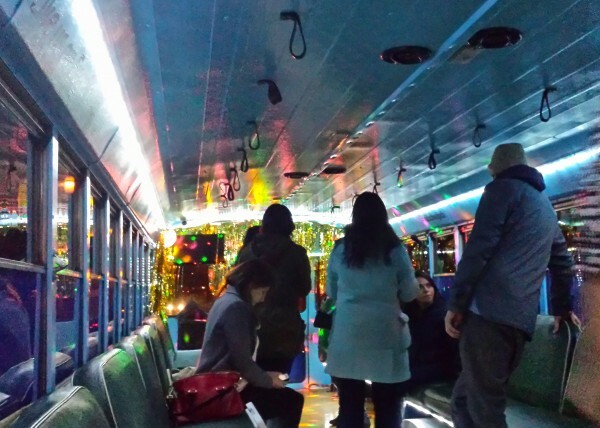 We recently had the opportunity to meet up with other Portland food bloggers and go on a food crawl to four amazing restaurants via a karaoke bus! Sounds pretty amazing doesn’t it? So what is a food crawl? And have you ever rode on a karaoke bus? 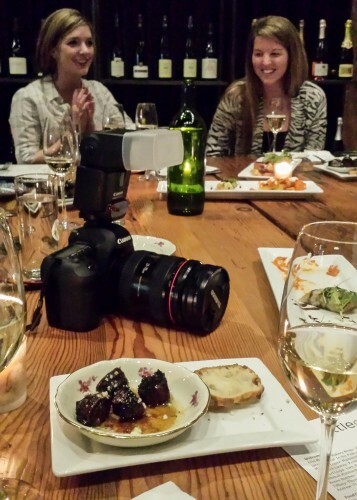 How about eating out with food bloggers? Well…It’s not your everyday going out to dinner experience! 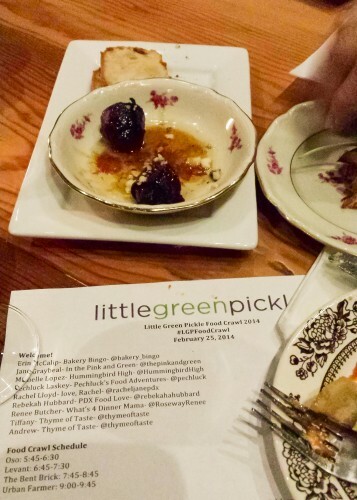 Little Green Pickle put this event together and contacted a handful of Portland bloggers.We all met at OSO Market and Bar, the first stop on the food crawl, and the only one we knew about so far. The others were left a mystery until we arrived at OSO Market and Bar and were given the agenda for the night. 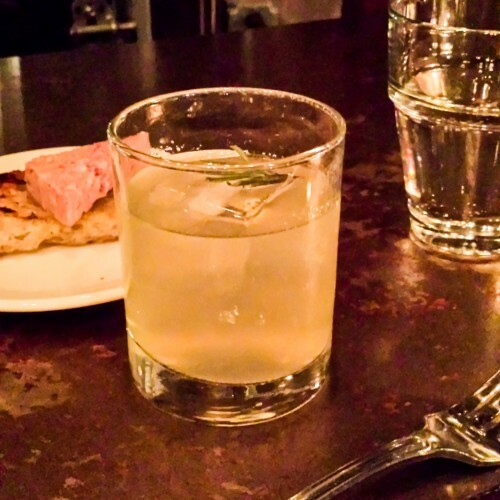 The plan was to spend about 45 minutes at each restaurant sharing small plates and bites with a cocktail, then off to the next one via the Old School PDX bus With so many great restaurants in our city of Portland, I was very curious which ones we would go to. 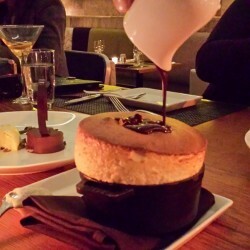 Well, they picked 4 great restaurants, all had amazing food, and cocktails! 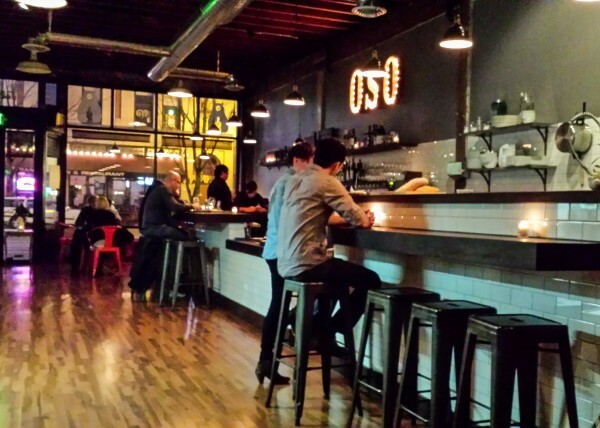 First up was OSO Market+Bar, part bottleshop, part specialty market and part neighborhood bar, this industrial space has a warm feel to it. I could easily see us here on a night out, enjoying tasty bites with a bottle of wine! My absolute favorite dish we had was their Tales and Trotters Chorizo Stuffed Dates wrapped in bacon with cumin honey and sage oil. I loved it so much, Chloe from LGP emailed me the recipe! After mingling with the other bloggers, we headed on to the bus! 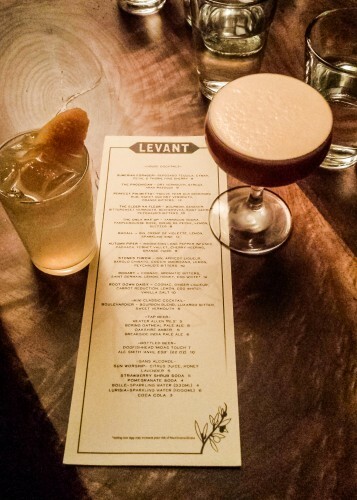 Stop 2 on the food crawl was Levant, a French- Arabesque restaurant. I had no idea what to expect! 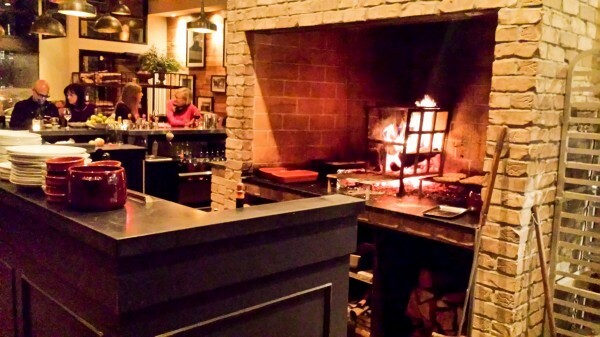 Walking past the sleek bar, there is a open wood fired oven next to the kitchen. I bet tasty dishes come from that oven all night long! 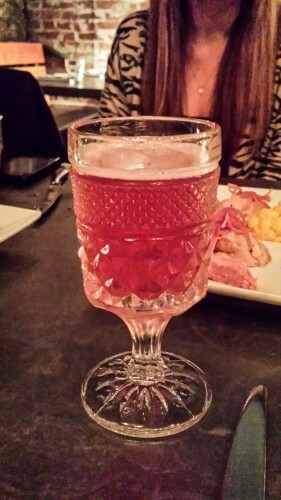 Aside from amazing dishes, they serve up some tasty crafty cocktails too. I had the Bogart, a smooth cocktail that consisted of cognac, aromatic bitters, saint germain, lemon, honey and egg white. 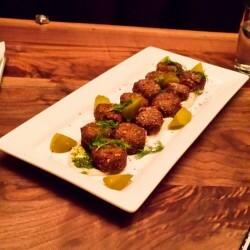 My favorite dish of the night at Levant, was the Feta and Armenian Cheese Cigars. A texture resembling phyllo dough filled with cheesy goodness! After mingling, eating, drinking, and photo taking at two amazing restaurants, we still had two more to go! On the bus, we enjoyed wine from Hawks View Cellar, after all we did have a driver! 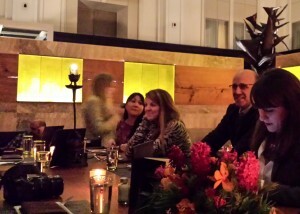 It was fun watching some of the bloggers singing karaoke as we made our way through the Portland Food Crawl! Off to stop number three! 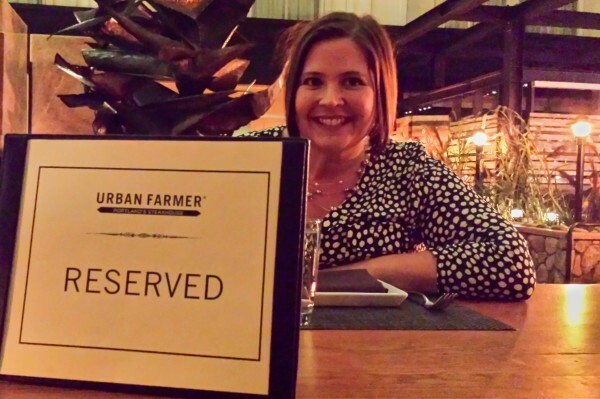 On our last stop was the gorgeous Urban Farmer, located in the Nines Hotel. I had no idea, this was our dessert stop. All desserts….I think I was in heaven! The place is beautiful, with every tall ceilings leading up to all windows on the ceiling, it’s breathtaking. We were served a very unique cocktail, Elixir Bianco made with vodka, calisaya and cocchi americano that is aged for 30 days in oak barrels. A strong smooth cocktail it was! 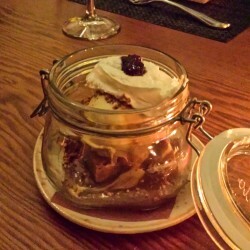 With so many desserts we tried, my very very favorite was the butterscotch sundae- a warm brown butter blondie with cherries, praline and toffee chip ice cream served up in a mason jar! It just melted in your mouth! I think we tasted five desserts in all. The pastry chef makes some amazing desserts here, both pretty to look at and fun to eat! At the end of the night, we hopped back on the buss and had one last glass of wine and heard one last song be sung, then it was back home. 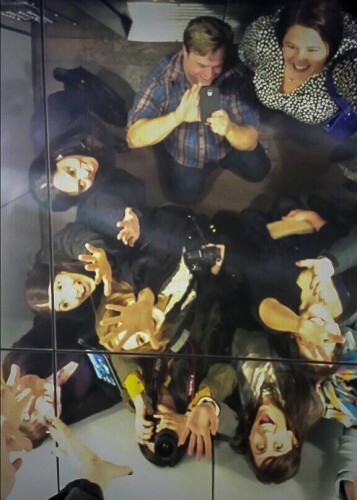 We had an amazing time, and met some truly amazing bloggers on this food crawl. We really are lucky to have so many great restaurants in our city. 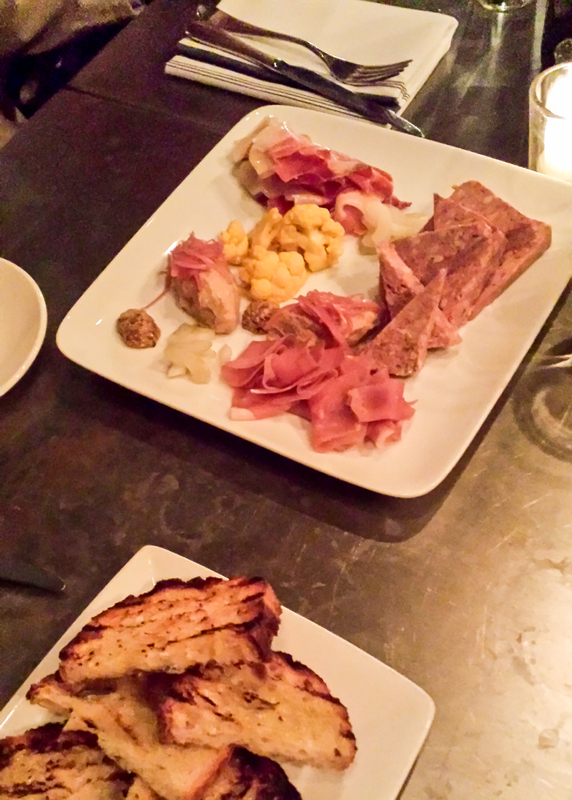 If you have never been to these restaurants, I highly suggest you give them a try next time you visit Portland, we are definitely going back to try more of their great dishes. To read more about the other Portland bloggers, check out their sites below, and many thanks to Little Green Pickle for organizing such an epic event! Loved the photos! They are beautiful!!! So much fun! And great to meet you! Can’t wait for more foodie adventures. Looks like ya’ll had a lot of fun!! This was so much fun! Love the image of the nearly empty plate of bacon-wrapped dates – they were so so good, you’re lucky there were any on the plate at all! P.S. Thanks for updating my blog with the new info. 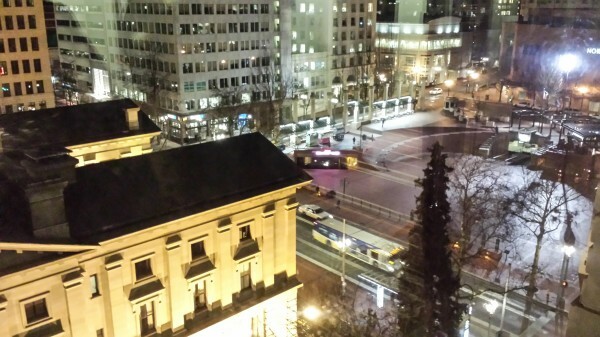 Oh I know.. those dates are still the best in PDX! 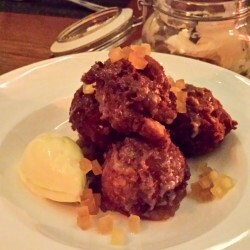 I finally posted my recap of the LGPFoodCrawl up at pechluck.com and linked your blog to it also. 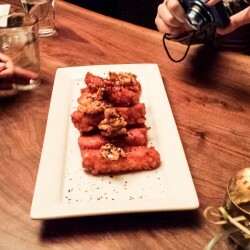 I want to go back to Levant soon for the fried cheese- both of them! What a fun evening that was, I’m still in a bit of withdrawal from it. I hope to see you both again soon! Thanks Pech! Yes, good times for sure!